Founded in 1998, by Russell King, LeadMaster is a pioneer in SaaS. Their first large customer was Compaq. LeadMaster has its headquarters in Roswell, GA, USA. Their primary data center is in Florida, with a secondary data center in Calgary, Alberta, Canada. LeadMaster offers a full range of integrated sales and marketing products at an affordable price. LeadMaster is sold exclusively through Value-Added Resellers and distributors. The monthly subscription covers installation, upgrades, maintenance, and software licensing. Some resellers may offer their own prices and may provide their own technical support. LeadMaster Lead-Xpress, $10/user/mo or $2/lead: Manage sales leads; update lead database quickly; schedule appointments; schedule leads; text message alerts; mobile access; marketing automation & workflow; Outlook integration. Small Business, $150/mo: 3 users; 10,000 contacts; 5,000 emails/mo; lead management; campaign management; email marketing; website integration; marketing automation & workflow; opportunity management; CRM; lead nurturing; quota management; mobile access; Outlook integration. Professional, $250/mo: 5 users; 25,000 contacts; 10,000 emails/mo; lead management; campaign management; email marketing; website integration; marketing automation & workflow; opportunity management; CRM; lead nurturing; quota management; mobile access; Outlook integration. Organization, $500/mo: 10 users; 75,000 contacts; 20,000 emails/mo; management; campaign management; email marketing; website integration; marketing automation & workflow; opportunity management; CRM; lead nurturing; quota management; mobile access; Outlook integration. The LeadMaster platform is very flexible, able to support call centers, manufacturing, services, real estate, mortgage, franchise operations, and health care. 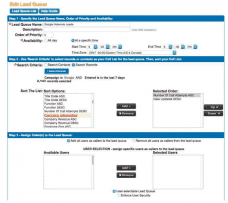 LeadMaster is available exclusively through VARs, so prices vary depending on the vendor. The same feature that may be included in one vendor’s package may be a premium feature in another’s. LeadMaster offers a generous 30-day free trial. LeadMaster has an integrated system that identifies visitors to a web site who do not fill out any sign-up forms. A few other companies offer this service, but LeadMaster is the only major CRM provider that can do this natively. The system, known as both LeadCaster and Lead-Xtreme, acts as a caller-ID for your web site visitors. It can even alert you when a competitor or a major client is looking at your web site, and what they looked at. By some estimates, only 3% of visitors sign up for more information, so this is a great way to reach out to interested leads. The LeadCaster feature alone may be worth the price of admission. LeadMaster also has a pricing tier called Lead-Xpress. Available for only $10/user/mo or alternately priced at $2/lead, this tier gives you some of the most popular features of the LeadMaster CRM, but at budget price. What Do You Think of LeadMaster?